There she is! So The Weinstein Company unveiled an official teaser poster on Moviefone for Simon Curtis' My Week With Marilyn, the period film starring Michelle Williams as Marilyn Monroe on her trip to England in 1957 to shoot Laurence Olivier's The Prince and the Showgirl. It's a cool poster, but it's pretty simple, just lots of white and a photo and some text, but I admire that simplicity. In fact, I think I'm most interested to see Eddie Redmayne as Colin Clark on this poster, the guy (also in color) to the right, who was assigned to follow Monroe around London wherever she went. We've seen a first look but no trailer yet. In addition to Williams as Monroe, the cast includes Eddie Redmayne, Kenneth Branagh as Sir Laurence Olivier, Judi Dench as Sybil Thorndike, Dominic Cooper as Milton Greene, Emma Watson, as well as Julia Ormond. 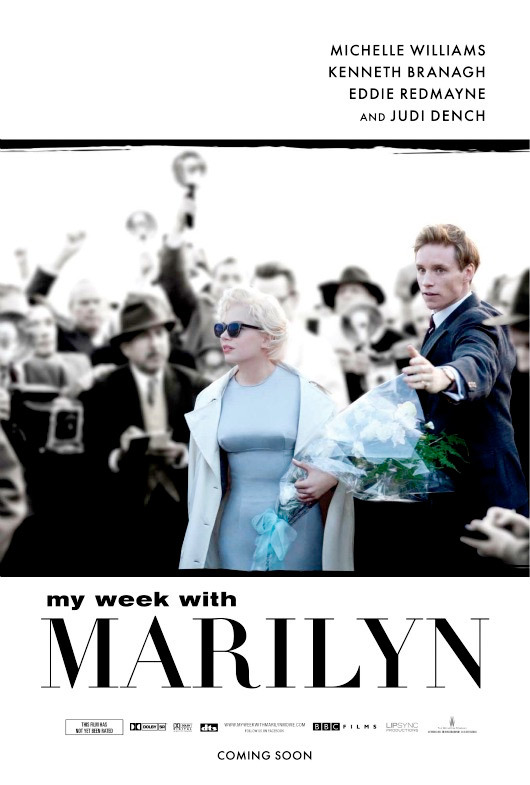 My Week with Marilyn chronicles a week in the life of Marilyn where she escapes the shackles of her Hollywood career and embraces British life with Colin Clark, who was assigned by Olivier to keep an eye on her while filming The Prince and the Showgirl. Directed by Simon Curtis (British TV movies) and produced by David Parfitt, the film is based on Clark's diaries and was adapted for the screen by Adrian Hodges (BBC's "Primeval"). TWC will be bringing this to limited theaters starting November 4th this fall. She doesn't really look like Marilyn, but we'll see. There's something about Michelle Williams that makes her such an interesting woman imo. That being said, I don't quite see her as Marilyn, we'll see. This is a stellar all-star cast but there are too many actresses playing Marilyn Monroe in different projects. Poppy Montgomery in the television mini-series, Blonde, Michelle Williams in My Week with Marilyn, Naomi Watts in the forthcoming film, Blonde, Angelina Jolie was rumoured in The Life and Opinions of Maf the Dog, and of His Friend, Marilyn Monroe. I wish only one actress would play her in every project. I feel like she doesn't photograph well as Marilyn but I bet she will be amazing int he film. Does that make sense? I am sure, as with most of her recent films, she will ace this film as Marilyn...Very anxious to see it! Ugly and Artless poster. Composition makes no sense. Lacks charisma and oomph!